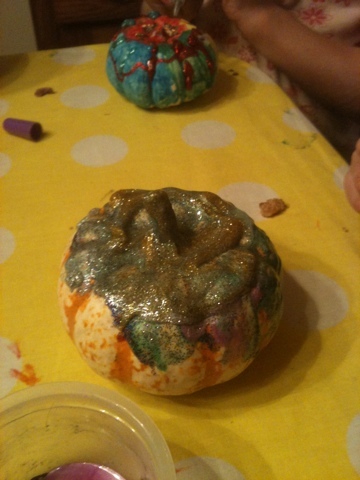 Thanks to our great neighbor for this painting pumpkins project. 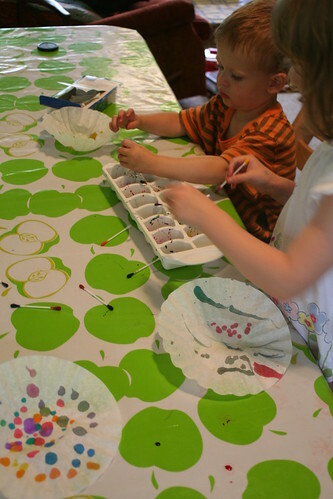 The best part (in the kids opinion) is that they get to use glitter glue. I think I owe her a new package of glitter glue though, my guys are a bit heavy handed with the stuff. 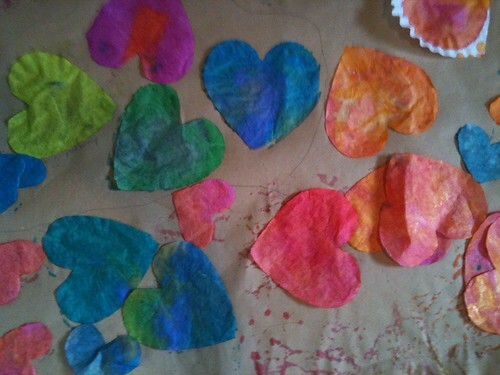 This started off (in my mind) as a collage project using tissue paper and glue colored with liquid water colors. We used some of the large sheets of packing paper that Amazon always includes in their boxes — the kind that is perforated and usually hardly wrinkled at all. The paper is a bit thin but worked fine, especially since the kids were more interested in putting the gluey paint all over themselves. 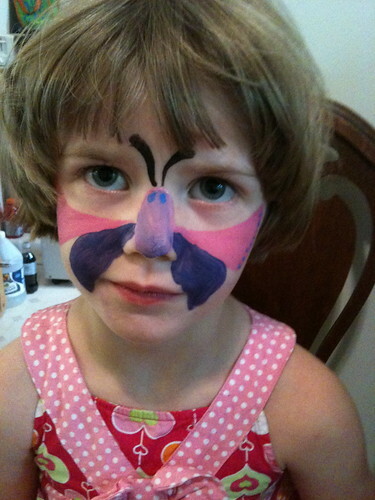 (I had to restrain myself from getting too cross when Eleanor didn’t want to change out of her fancy dress. I guess that is what it is for, to be worn.) 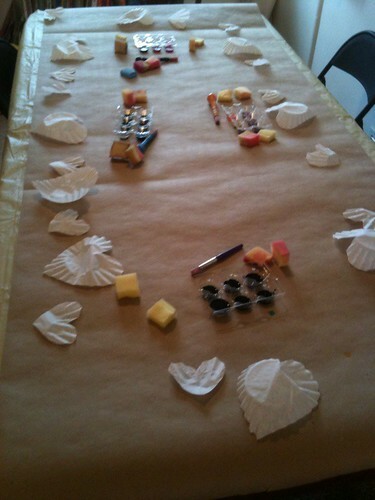 In the end, they had a great time (and a LONG time) peeling the colored glue from their skin. There is something satisfying about that, eh? I’ve got a lot of backlog on projects I want to put up here. 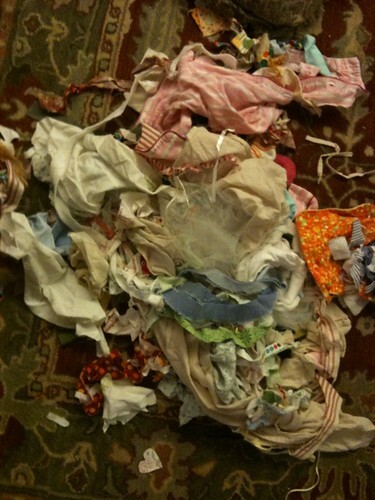 Somehow having a third baby has slowed things down a bit. But, happy to report that we are getting back into some sort of a routine and certainly enjoying our new little girl. 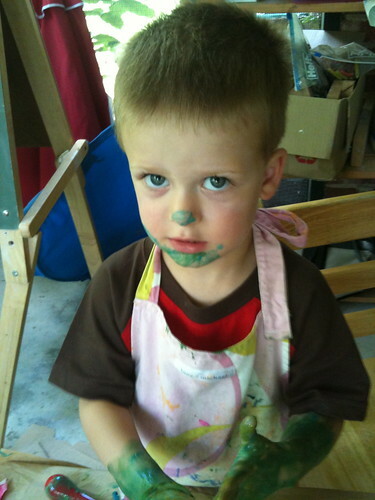 The kids have been painting quite a bit lately, the back porch is open as the studio again so there is more space to make a mess. 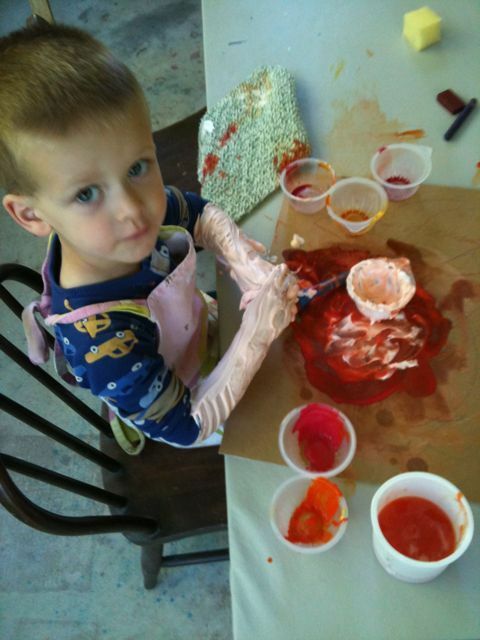 We recently tried marbleized prints in shaving cream with liquid watercolors, which was quite fun. 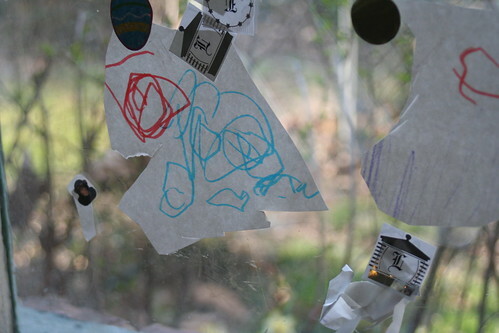 I didn’t really follow any particular plan, though I am sure somewhere in the back of my mind there was a project I had seen, probably over at The Artful Parent. 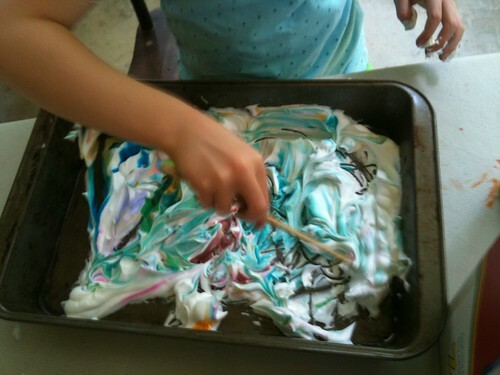 I filled up a tray with shaving cream and Eleanor squirted in a few colors from the watercolor bottles. Then she used a chopstick as a swirler. 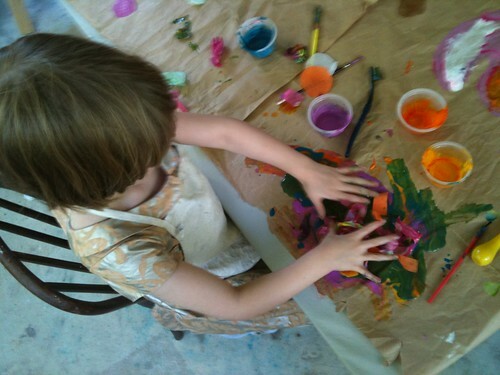 My initial thought was, “don’t swirl too much or the colors will turn brown”, but she kept going and her prints were much more interesting than the first one I did as an example. 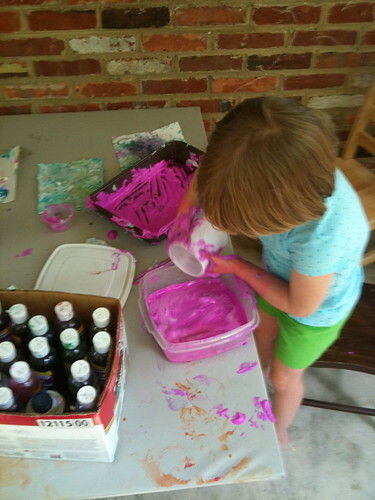 After a few prints, it turned a bit more mad scientist — she added water and about half a bottle of the magenta watercolor when I was not watching. I guess I would have preferred that she used a smaller amount but she sure was having fun and, after all, I did leave the box out for her to get into! Eleanor has been at summer camp and Henry has been lamenting the fact that he is too young to join her. So, we have started “mama-Henry camp”. Things are going pretty well, as you can see! 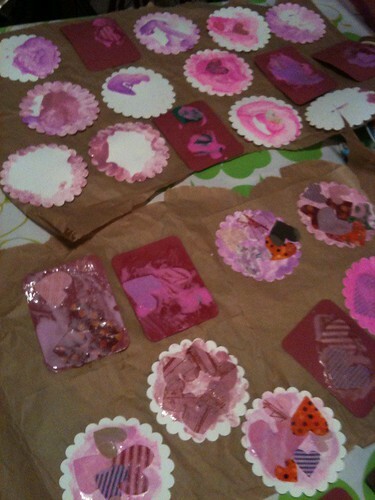 Normally I am not nearly this organized, but instead of working on my big project, the kids and I made Valentines today. I figured it would be fun and they will likely need them for their classrooms at school come February. 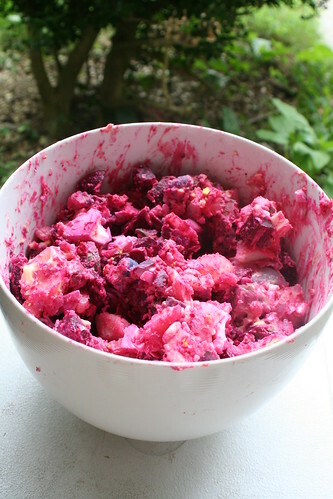 I must admit, recently I have thought about Valentines a bit more than is probably normal. 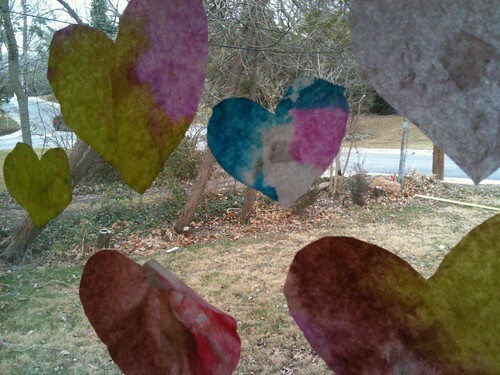 I have wanted to use up some of my very small scraps of fabric that are too small to do anything with, so the idea of cutting hearts and glueing them to notecards seemed like a perfect solution. 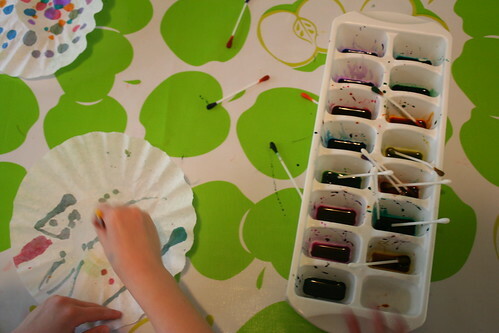 I put some liquid watercolor paint in with the glue, just to make it a bit more like painting for the kids, and the three of us spent a nice evening working on our project. 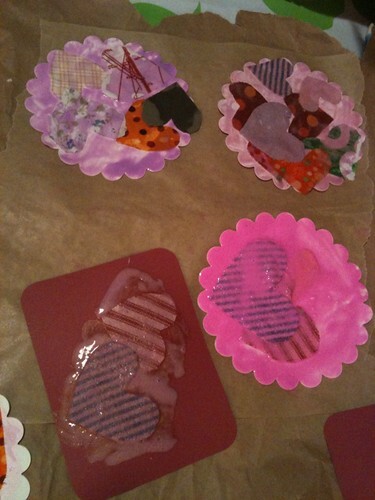 The cards were fairly glue heavy, but that was alright since we had a place to dry them. 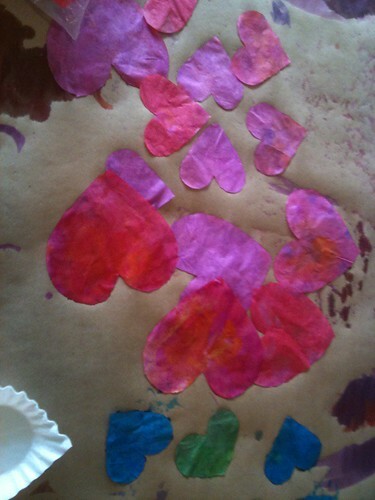 Henry started out adding the hearts but ended up enjoying just painting the notecards with painty glue. I think they turned out pretty well, I plan to carve a “happy valentines day” stamp and have the kids (or at least Eleanor) sign their names on the back. Good thing I have a whole month to get that part done! 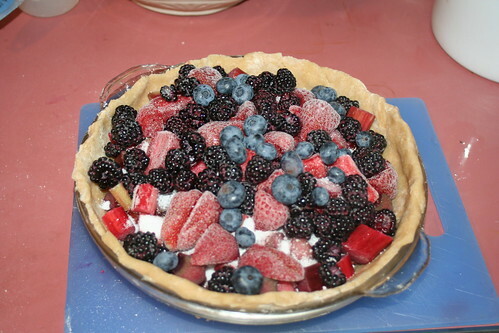 A shot of one of my bumbleberry pies before the crumbly topping went on. And with that, I am hoping to get to some new and more interesting stuff. 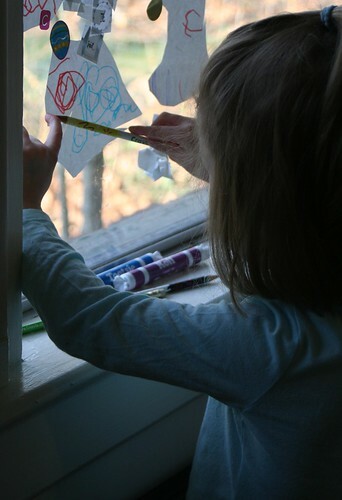 We have been doing quite a bit of drawing lately, some painting, lots of cutting with scissors and even some installations (with paper and stickers on windows), too. 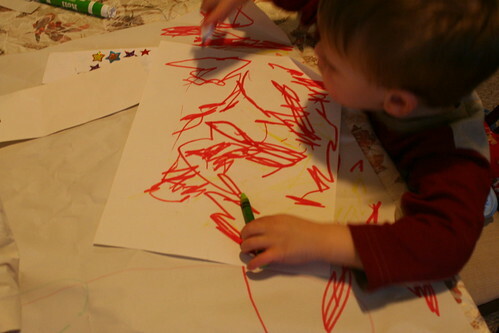 Both kids become absorbed by the process of making marks on paper. Henry makes lots of small marks with an occasional long streak across the page. 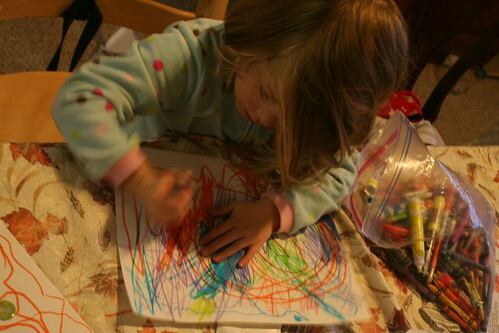 Eleanor uses circular motions, hard scribbling and even makes some very deliberate marks — mostly when Henry is asleep though. 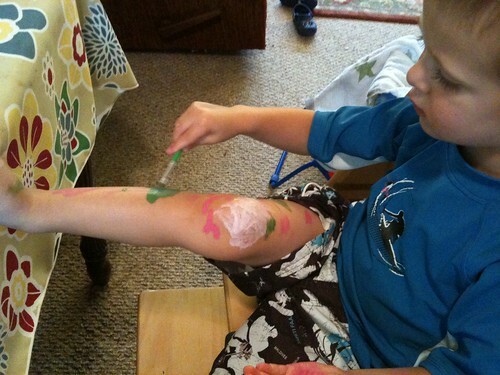 Marking tool of choice right now, for both kids, are these not-entirely-washable stinky scented markers. 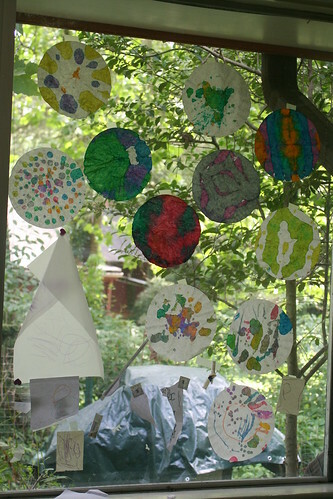 Installations have been created in various windows reached by standing on boxes of CDs or the couch, using cut pieces of paper, stickers and markers/colored pencils/crayons. 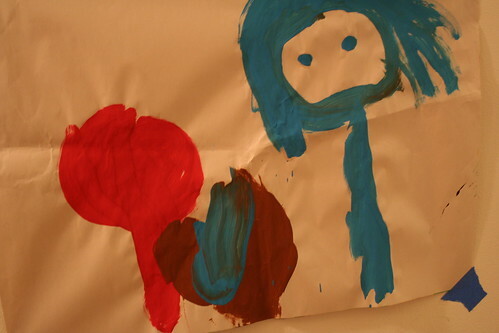 And, the other day while Henry was asleep, Eleanor painted a couple of “Mickey Mouses”, which involved two circles (ears? or eyes?) and a curved line, presumably the mouth. 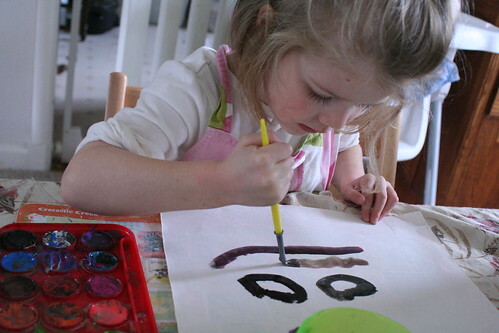 She did say that she was painting a neck on one of the pages — I think it was the one in the picture below. 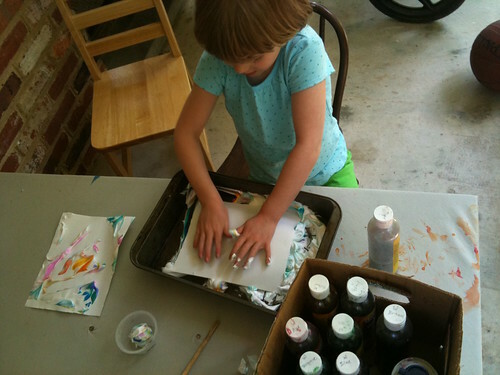 She is beginning to understand how to effectively use watercolor paint, which is much more translucent than the tempera she normally works with at school. 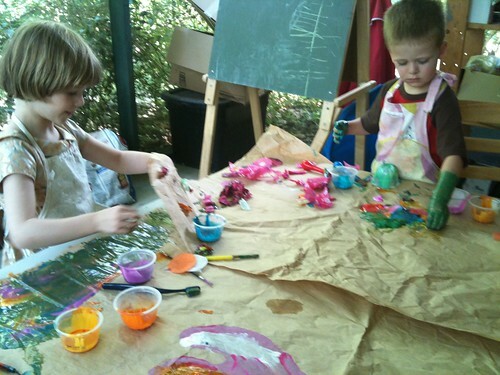 I love to see them hard at work, engrossed in their own creative processes.